Our customers have increasingly higher demands for automation. 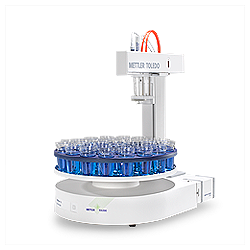 METTLER TOLEDO’s Automated Titration Systems increase your productivity and enhance reliability. Modern and productive InMotion™ Autosamplers maximize throughput in minimal space. From eliminating process order and transcription errors of sample information, to complex cleaning and environmental control and protection for analysis, our autosamplers help achieve flexible workflows and deliver efficient analyses. Just put your lab flexible and efficient InMotion™ Autosamplers to work for you. Rondolino is a carousel-type titration stand for METTLER TOLEDO general titrators used to automize titrations. 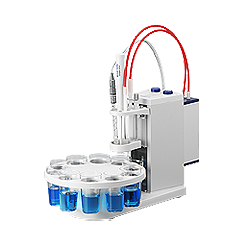 This compact and simple automation can be loaded with up to 9 sample beakers and one conditioning beaker. With a footprint of just 25 x 35 cm, Rondolino needs considerably less space than a typical sample changer. In combination with a V30S or C30S Karl Fischer titrator the Stromboli KF oven autosampler enables up to 14 samples to be titrated in unattended operation. The samples are automatically transferred into a temperature controlled oven from where the evolved water is transferred to the titration cell via an applied gas flow. 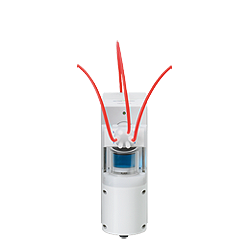 Controlled by the titrator, the robust Liquid Handler automatically doses and pipettes samples with the highest degree of accuracy. This enables the most demanding of automation processes to be reliably implemented. Thanks to the mechanically robust design and chemically resistant materials, reliable results are obtained even under most intensive usage throughout its lifetime. 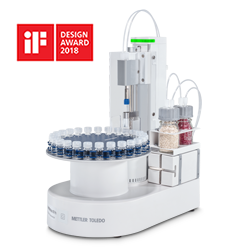 Selected METTLER TOLEDO Methods for InMotion™ Autosampler. The InMotion™ Autosamplers, with various accessories, offer clever solutions for improving your daily routine tasks in titration, density and refractive index applications. Click the link below have an overview on relevant booklet. This booklet describes the automation features of InMotion and gives you some example applications that can help you improve your laboratory workflow. The Rondolino automated titration stand is perfect for automatically testing up to 9 samples with simple sample to sample transition. The Karl Fischer Autosampler provides precise and efficient measurements, with a variety of innovative features and accessories, for your routine Karl Fischer titrations.